There’s always something happening at Deer Creek! Fall is definitely wine season! The long-awaited grape and fruit harvest is happening all around our region, and gallons upon gallons of juice are being pressed and stored until it’s time to be turned into wine! About 25,000 gallons of that juice will be coming to our Deer Creek Winery warehouse in the next 12 months to be turned into about 125,000 bottles of your favorite wine! Here are some more great ways to enjoy the upcoming seasons here. Join us for an old-fashioned cookout! Our famous annual Grape Stomping Contest! Get your partners and come ready to stomp grapes the old fashioned way and see how much juice you can produce! Enjoy a 3-course dinner and dessert while trying to figure out “who done it”! You can be a character or feel free to sit back and watch the scenes unfold during the night. There will be costume judging and a prize for the group who solves the mystery! $45/person. Let us help you take the perfect gift to your Thanksgiving Dinner host or to serve our delicious mulled wine kits. Various flavors of our wines like our Cranberry Mist, Peach Blossom, Autumn Breeze, or Rustic Red mixed with a few ingredients plus our organic Mulling Spices make the best warm wine drink around. Your hostess will love it! Your house will smell so delicious if you’re serving it to your guest! Add to dinner some of our Delectable 25% wine sorbet, and your meal is complete! Winter is a time to enjoy friends and family and then settle in for some extra snuggles and relaxation. Our winery offers the same weekend FREE live music concerts and other events in our spacious Gathering Place during the coldest months of the year. Come out for some old-fashioned Christmas singing and enjoy some cookies and hot chocolate. Wine is available for purchase, of course. We’ll have live music from 2pm-midnight. 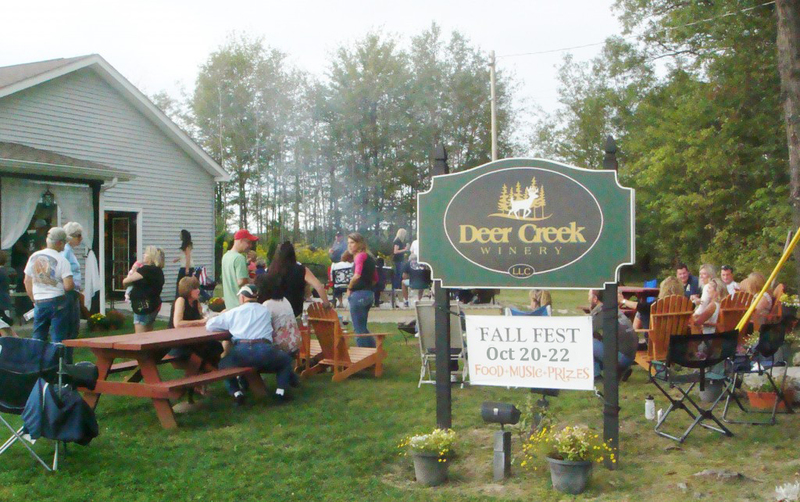 Come out for some great music and dancing … Deer Creek style! It won’t be a boisterous party, but we’ll ring in the New Year together! A $10 cover charge will begin at 9pm. Bring your honey out for a night she won’t forget. We will serve a full meal with dessert and a bottle of wine per couple while you listen to mellow live music by Bryan Phillips, one of our regular classic country singers. It’ll set the mood for some romantic slow dancing! Who needs a holiday to just get away, relax, rejuvenate, and reconnect! 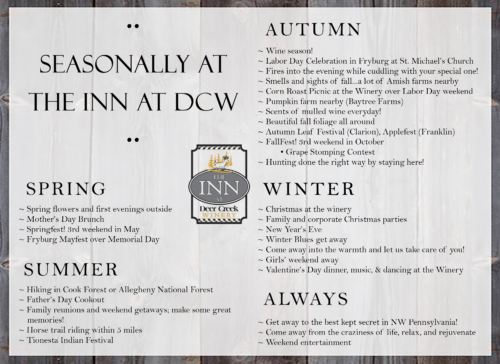 Guys, you can’t go wrong by surprising her with a few days away at The Inn at Deer Creek Winery! Do you have a hard time buying gifts for others in this culture of abundance? Do you sometimes pick something that’s just not right and end up feeling bad? We have the perfect way to tell what kind of wine your friends and family will love just by asking questions about their personality through our Vinotype Wine Preference guide. You can even get the wine wrapped and ready to go! We love having local musicians here to entertain our guests! It kicks off Friday nights at 7pm and then again on Saturdays starting at 2pm and continuing through 3 acts until 10pm! Sunday also features a music set from 2-5pm. Weather permitting, the FREE concerts are held outside. When the weather doesn’t cooperate, our inside Gathering Place or Vino’s Den holds lots of people to enjoy the music, food, and wine while relaxing with friends or your significant other! 8 beautifully decorated, spacious rooms await your overnight stay with us. You choose your breakfast entrée and whether you’d like served in your room, on a porch, or in our dining area. Take time out of your busy life to relax and rejuvenate here. We’ll take great care of you! We open our bottling facility up for tours and access to our winemaker to ask questions from 10am-3pm! We usually have some wine ready for you to bottle as well so you can really see how the process works! Brunch is available those Saturdays, and then you can stick around for our FREE concert in the afternoon, too. 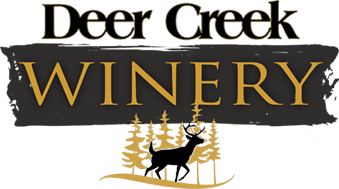 Every second Saturday of the month, Deer Creek Winery will be offering a Wine Tasting Workshop. The workshop is only $15, wineglass included! We are offering 3 one-hour sessions. You can choose to come at 1pm, 2pm, or 3pm. Our knowledgeable staff will teach you the basics of how to get the most from your wine, while having fun doing it! Monthly at all outlets on various dates. For more, see our website and Facebook. We also have our Wine Tasting Workshop $15 monthly at all outlets on various dates, see website, and Facebook for dates. Regardless of the season or holiday, there’s always something happening at Deer Creek and its outlets!